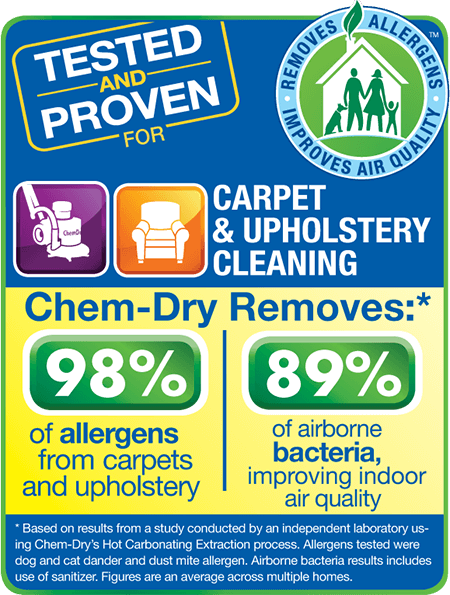 Chem-Dry is the world leader in carpet and fabric care, with 3,500 franchisees across 50 countries. With a mission to help people live healthy lives, our specialized service provides a deeper, long-lasting clean that gives your home a healthy makeover. Our core cleaning solution, The Natural®, perfectly balances mother nature’s ingredients with carbonating bubbles that lift the dirt up out of your carpet and upholstery, cleaning them thoroughly. It does not contain soaps, detergents or harsh chemicals making it safe and non-toxic for your family & pets. Our proprietary Hot Carbonating Extraction (HCE) process uses millions of tiny bubbles to penetrate the carpet and upholstery fibers, dissolve dirt and stains quickly, and lifts the dirt to the surface for extraction without the use of heavy amounts of water, therefore taking lesser time to dry.